I’ve made two of these already this week and I’m going to make another one for my father-in-law’s birthday tomorrow. The recipe is from ‘The Big Book of Chocolate’ – 365 decadent and irresistible treats. Only 364 more recipes to try! 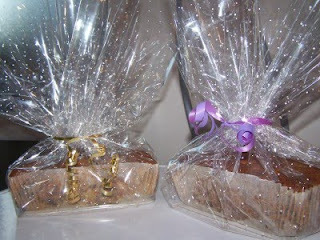 Cellophane and re-cycled gift ribbon increase the glamour! 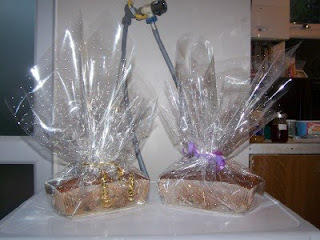 Love the cellophane wrapped cakes Melanie, lovely sharp corners on the cakes, when did you get time to visit Harrods…………?